Bataan Gov. Abet Garcia was extremely elated to have spent for the first time his province’s Foundation Day. On his Facebook account, Garcia narrated how Bataan, who was once a town in Pampanga province, was established as a new and separate province on January 11, 1757, through a decree by then Spanish Governor-General Pedro Manuel de Arandia. But it was not until today that the province finally celebrated its founding anniversary, another milestone in their history. “Despite the fact that we have been recognized and functioning as a separate independent province for the past 261 years, it is only now that we are going to observe our foundation day,” said Garcia. 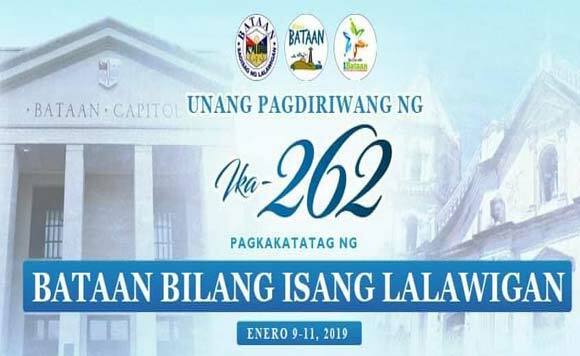 The politiko also gave a shout out to Bataan Reps. Geraldine Roman and Jose Enrique Garcia III for jointly filing House Bill 3718 seeking to declare January 11 of every year as Bataan Foundation Day, making it as a special non-working public holiday in the entire province. “We Bataeños have been through a lot, we have withstood many challenges, wars, calamities and many others. But we have as always remained resilient and victorious. As we celebrate our 262nd founding anniversary, let us celebrate it with renewed commitment to uphold what our forefathers have started and fought for, that will also serve as our inspiration and guiding light in pursuing our vision of making Bataan the best place to live, study, work and even raise a family,” he said.